Turkish Prime Minister Recep Tayyip Erdogan (L) listens as U.S. President Barack Obama (R) addresses a joint news conference in the White House Rose Garden in Washington (Kevin Lamarque/Reuters). This article was originally published here on Salon.com on Sunday, May 14, 2017. 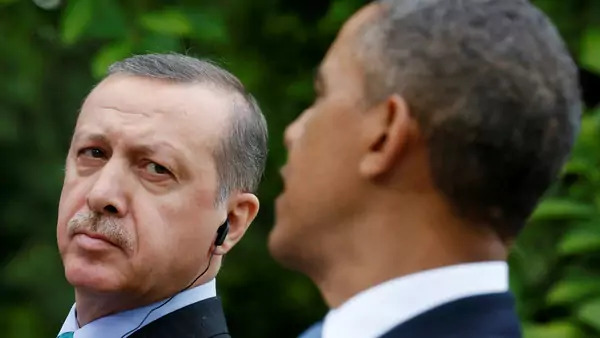 The tension had been eased considerably when Obama and Erdogan cleared the air in that private meeting in Toronto and agreed on a way forward for Turkish-American relations. Over the following two and a half years, relations were generally cooperative and constructive, especially in those exhilarating days of the Arab Spring, which saw the fall of leaders in Tunisia, Egypt and Libya. Trump has a more straightforward option: Use more vinegar than honey. When the Turks berate the United States for supporting “terrorists” — that is, the YPG — it would be worthwhile for the Trump administration to publicly remind Ankara that it has much to answer for in the development of jihadi networks in and around Syria. After all, when the Turks failed to cajole the United States into what would have been an extended military operation to bring down the Bashar Assad regime, they turned a blind eye to terrorists, who began using Turkish territory to fight in Syria. Over time, Turkish intelligence coordinated with some of these groups, though not the Islamic State.